WHO could have envisioned in 1928, when a dozen young men were making the first glider experiments at the University of Michigan, that the crude ship then used was the forerunner of what would ultimately be one of the world’s great means of transportation? These members of the first glider club of America, which was formed under my sponsorship, learned the delight of being pulled into the air with a rubber cord and gliding gently to the ground several hundred yards away. Some of these same young men today are still flying gliders, beautiful ships known as sailplanes which have established records of distance, altitude and duration that are almost unbelievable. Looking toward tomorrow, we can see the same principle employed for motorless cargo ships towed by tractor or tug planes, carrying enormous loads of freight or delivering human cargo in the most quiet and delightful way ever known to man; ships that will carry twenty tons or more freight or up to 100 passengers, with no engine vibration, no noise, with a wing span and a speed which will assure smooth riding. One employing such facilities can rest comfortably at night and arrive at his destination as rested as if he had slumbered in his own bed. Freight thus transported could be delivered in quantity at 200 miles per hour and at a cost well within the range of economical shipping; in other words, somewhere between two and three cents a ton mile. According to the best information obtainable today this is less than truck freight or boxcar freight and only a fraction of the cost of railway express. Cargoes of oranges, grapes and other perishable fruits could be loaded ripe in California, something unheard of today, and delivered in New York in time to go on the breakfast table the next morning. A few basic figures will give a fairly good conception of the advantages of this modern means of transportation over anything evolved before. The average train of loaded box cars carries 2,000 tons of freight at 25 miles an hour. Seven glider trains could deliver the same freight in one-tenth the time or, to express it differently, seven glider trains could deliver ten times as much freight as a railroad train in the same length of time and in much better physical condition, as the cargo will not be subjected to the shocks of switching and shunting. The Army, transporting goods from Northern India into China by airplane, requires 35 planes to do the work formerly done over the Burma Road with 7,700 trucks, 4,500 of which were in constant on the leading edge of its wings, it can be molded and faired so that its nose resistance is one-third that of an airplane. Because it does not carry an engine with all of its inherent strains, it can be built much lighter. But with its wing spread and with heavy wing loading, the glider can carry a gross weight equal to the transport plane, which would be approximately twice the pay load the transport plane would carry. In other words, the weight normally consisting of fuel, engines and the heavier bracing in the transport plane could be replaced by payload in the glider. General railroad freight at present costs slightly under one cent a ton mile. This cost includes coal, ore, grain, sand, gravel, stone and other bulk commodities. Personally I do not believe air freight will ever be able to compete in this particular field. Its place is for the higher grades of freight. We would be remiss if we confined our thinking to the North American continent. Once in the air, great planes and gliders can span the oceans in a few hours. Freight that now takes 10 to 14 days to deliver by cargo ships will be safely brought to its destination by air in as many hours. The world will shrink to a size where we can look upon the Fiji Islander as a next-door neighbor. We will then be able to take our vacations in the South Sea Islands with much greater ease than we used to go to the Riviera. 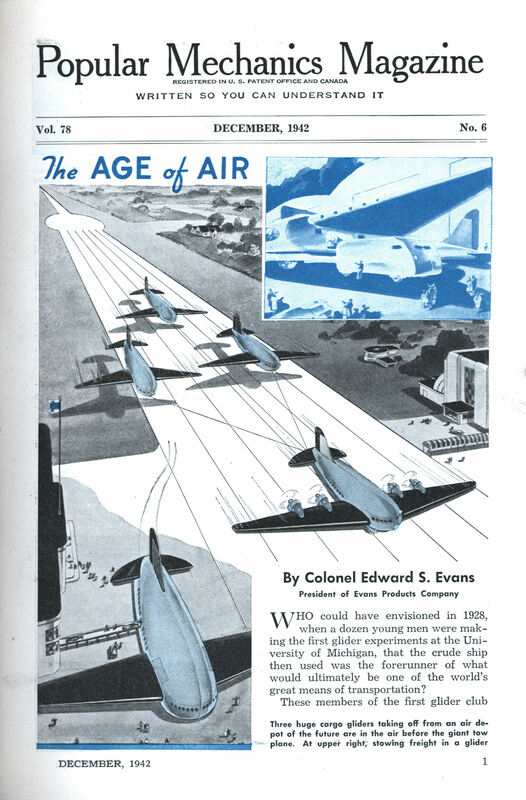 Airplanes and gliders will be built with wing spans of over 300 feet; methods will be developed which will insure greater safety than any present mode of transportation; speeds will accelerate to 500 miles an hour; the substratosphere will become a highway; ships will carry internal air pressure for comfort of the passengers. Future generations will look upon our present modes of transportation as we look upon the high-wheel ox cart. An interesting evolution brought about by modern modes of transportation will be the shifting of forwarding or port centers. If we study a map of the Arctic, we see that the cities of the middle west are as near Europe and nearer to Asia, than those on our own coast. Brought up to accept the conventional projections used by the mapmakers, we have become misinformed as to directions and distances between the great centers of the world. No projection on a flat surface can more than approximate the round surface of the globe. When we use the globe and the great circle measurements we find the Arctic Ocean, not the Atlantic, is the sea to be flown over. The Arctic becomes a Mediterranean between the Eastern and Western hemispheres. Chicago, Detroit, Cleveland, Cincinnati and other western cities are going to come into their own as great shipping centers and I can vision the day when America will have a great port in Alaska which will supersede in importance our present great shipping centers. It could be the New York of tomorrow. We are reaching an age where ocean travel as we have known it is going to disappear. There will be no more Leviathans, Queen Marys, or Normandies; freighters will be used much as our coastal freighters are used today to take the slow, cheap, bulky freight. All of the freight taking higher ratings will go by plane. It is a human tendency to say “it can’t be done.” I like to look back to thirteen years ago, to a speech made before the United States Chamber of Commerce, in which I said: “I believe that we are going to see great airliners, perhaps with a speed of 90 miles per hour, carrying 50 to 100 tons, which will be used to transport our freight.” Those prophecies have been more than fulfilled. 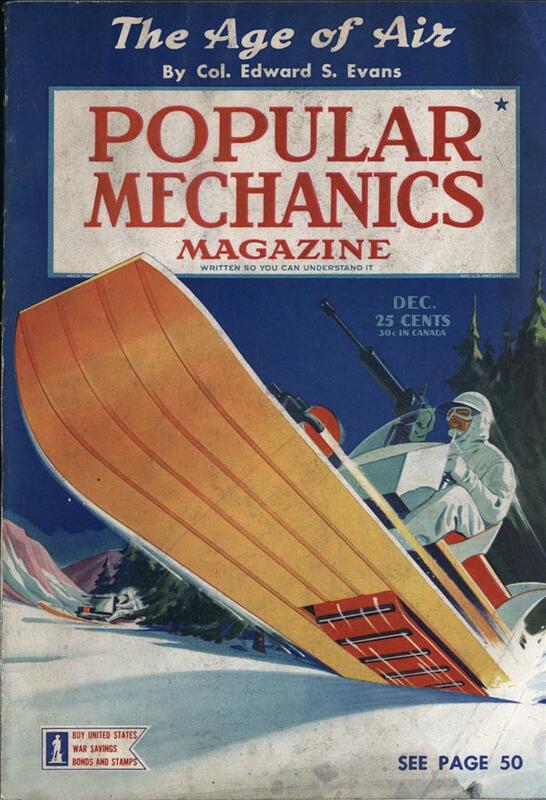 The statements that I make today are even more practical than were the prophecies made in 1929, because our experience and the development in aircraft, engine and glider design has made such progress that these prognostications are self-evident. Those planes will burn low-priced fuel, and they will transport that freight cheaply enough for the business men of the country to use them, because one of the greatest losses in business today is the carrying of inventories. Only yesterday the building of seaplanes in shipyards was deeply controversial. Within another year air transports will be rolling out of shipyards in such quantity as to confound the “authorities” who opposed the idea. As former president of the Lockheed Aircraft Company that built plywood airplanes which were the most successful of any at that time, I can speak with the authority of experience when I say that a large percentage of the big airplanes of the future will be built from wood rather than metal, due to the recent development in resin glues, a tremendous improvement in plywood and the art of molding it. Wood has many advantages over metal. It is more rigid, it is stronger, lighter and cheaper than metal. It can be molded so as to offer a perfect surface, as against the riveted metal, each rivet head adding its parasitic resistance to the air flow. Therefore, wood is going to take a prominent part in future airplane manufacture and the technical experience which we will get in this country, due to the building of airplanes and gliders of wood for the Army, will give us the initial information upon which we can build a great industry. We are entering a new age—an Age of Air. It will mean drastic changes in industry, the shrinking of the automobile and trucking business, the readjustment of the railroads to meet the situation and the vast new industry of airplane, glider and helicopter manufacture. Railroads will haul the heavy bulk loads such as coal, ore, grain, etc., and some of the slow freight. Trucks will handle small loads for short distances. The air will take the rest. Concrete highways will lose some of their importance and landing strips beside these highways will come into active use. Air fields will multiply 1,000 percent. The major portion of these will be for freight transportation, probably 25 percent for passenger planes, private planes and helicopters. The evolution in private transportation will be no less great than that in the public transportation lines. A recent development in helicopters contributes to the world a new mode of transportation which is safe, fast and inexpensive. I expect to see the day when thousands of these small machines will be used by private citizens where they now use their automobiles. The helicopter can land, take off, or hover in any spot as long as the craft is. It would travel from 100 to 150 miles an hour and will probably be brought to a degree of development where it can comfortably take the family, as the present automobile now does. The development to date has been on the light loads, the largest being the two- passenger helicopter. These machines will sell so cheaply they will be in the class of the higher priced automobile. They will not require landing fields, but the backyards, parking lots, or the street for the moment untraveled, will serve as a landing space. If the present plans for the building of strong, comfortable demountable houses are carried into effect, we may see the day when movements of population will be as simple as folding your house, loading it on the plane, unloading a few hours later at the new location and erecting the house within a few hours after arrival. No longer will we be tied to the earth by bricks and mortar and the expenses and difficulties of present day transportation. The millions of pilots and mechanics trained during the war will give flying, gliding and soaring in helicopters the same impetus the last war gave to the automobile industry. We thought when we entered the present Mechanical Age that nothing could surpass the opportunities offered at that time. The opportunities of the early 20’s fade into insignificance as compared to the opportunities which will come into use during the Air Age. One powered aircraft towing three gliders as on page 1 is an absolutely dreadful idea. The tow ropes for the gliders on the outside are diagonal. Tension tends to pull them straight…which pulls the two outside gliders together to crash into the one straight behind the powered aircraft, and each other.